Lamaze Toys offers an abundant array of educational (and adorable) products that help build your baby’s developmental skills. I strive for my daughter to become a brilliant and productive member of society. I strove for that since before she was born. I believe you must start early for such a thing to happen. 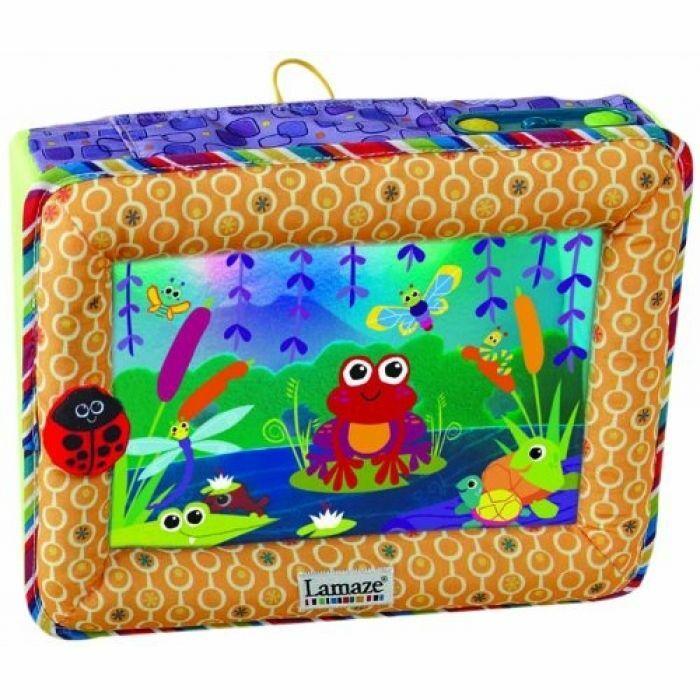 Lamaze Toys provides you the tools to teach your baby various things – like visual development, auditory development and tracking skills, just to name a few. I received the Pond Symphony Crib Soother to review. Although I do not have a crib to place this inside, I thought it would be a good idea to place on my daughter’s shelf in her room. While Isabella’s sleep routine has greatly improved, she still has nights where she has a difficult time falling asleep. The soothing music accompanied by this adorable display of pond critters is just what the doctor ordered. Isabella was zonked out in minutes. Of course, I thought “this was merely a coincidence. Maybe she was really tuckered out.”. So, I placed the soother on the shelf again during the following day’s scheduled naptime. Once again, she fell asleep with ease. Mind you, Isabella hates naps. She usually never takes one. I’m able to choose between displaying the lights only, the sound only or both. Isabella fell asleep to both the sound and lights. When it’s not bedtime, Isabella always points up to her shelf. The soother doubles as a toy. She loves to sit the soother on her toddler bed and gaze at it for a while. She often gets upset if I don’t look at it with her! The soother encourages for her to explore her touch senses, along with tactile exploration. One of my favorite features is that you can hook your mp3 player to the soother, and the lights will “dance” to the tune of your music. How neat! Never have I seen a product that could perform such a cool feat! It also comes with an adjustable volume feature and an auto shut off button. You can purchase the Pond Symphony Crib Soother for $44.99. Stay connected with TOMY Toys via Facebook, Twitter and YouTube. I like the shakin snail rattle. Turtletunes would be lots of fun for my baby too! I’d like the Baby Bling for my six month old. I like the captain calamari. I liked the counting zoo board book. We’d also like the Discover the Sea Carousel. I like the Octotunes toy! Thanks so much! I’d love to have the Soft Chime Garden! I like Cowgirl Carly Learn to Dress Doll. I would love to have the Lamaze Space Symphony Motion Gym. I also love the Soft Chime Garden, great selection of products! Thanks for the giveaway! I’d love to have the Spin & Explore Garden Gym.